Galaxy S7 Flat/Edge - How do I remove the memory card on my Galaxy S7? On the Home screen, tap Apps→ Settings→ Storage→ SD card → Unmount. 1. Insert the ejection pin into the hole on the tray to loosen the tray. 2. Pull out the tray gently from the tray slot. 3. Remove the memory card. 4. Insert the tray back into the tray slot. Note: Ensure that the ejection pin is perpendicular to the hole. Otherwise, the device may be damaged. Please note Do not remove the memory card while the device is transferring or accessing information. Doing so can cause data to be lost or corrupted or damage to the memory card or device. Samsung is not responsible for losses that result from the misuse of damaged memory cards, including the loss of data. 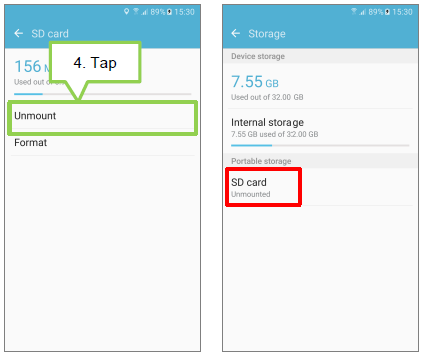 Galaxy S7 Flat/Edge: How do I format the memory card on my Galaxy S7? 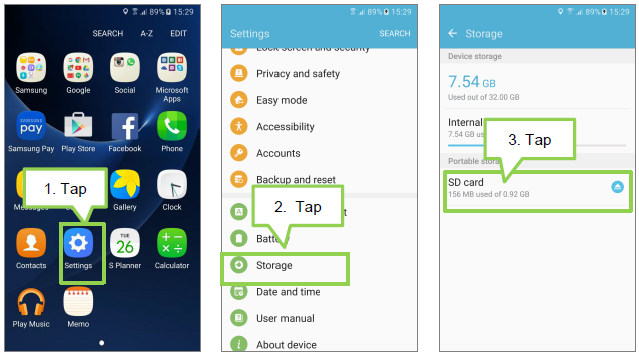 Galaxy S7 Flat/Edge: How do I install the memory card in Galaxy S7? [Galaxy S7 EDGE] Is device faulty if light leaks on window edge if being used in the dark?